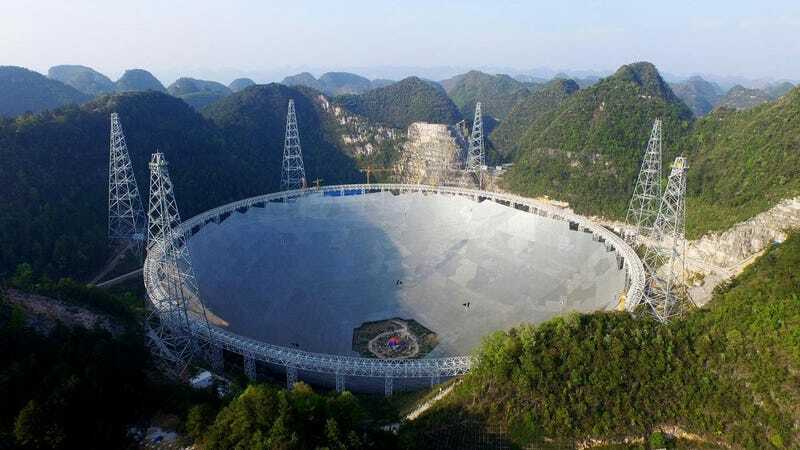 By now, you may have seen the incredible pictures of the Five-hundred-meter Aperture Spherical Radio Telescope or FAST, an enormous telescope in the Guizhou province of China that just turned on last year. You’ve also probably heard that, yes, many hope it will find signs of alien life. It’s already beginning to make discoveries. China’s Xinhua news agency reports that the half-dome telescope the size of 30 football fields has spotted dozens of pulsar candidates, several of which have been confirmed by the Parkes telescope in Australia. There are plenty of reasons why pulsars are cool: They’re constantly flashing beacons like distant clocks, which makes them useful astronomical tools for measuring distances, for example. Also, maybe aliens have built megastructures around them. Just speculating, here. Pulsars are neutron stars or white dwarves—dense star corpses that spin quickly and look like they blink from our vantage point on Earth. That’s because they send collimated beams outward like lighthouses. But all of the pulsars scientists have spotted until now have been within the confines of the Milky Way galaxy. As Xinhua reports, two of the pulsars are 16,000 light years and 4,100 light years away, named J1859-01 and J1931-01, respectively—still in the Milky Way. But the press release continues that FAST might be capable of searching for extragalactic pulsars by next year. But even exploring pulsars in our own galaxy is exciting. Most other telescopes are too faint to spot them, said Petroff, but there are probably lots that astronomers haven’t found yet. Maybe FAST could help. FAST has had its share of controversy. The New York Times reported last year that China planned to move more than 9,000 residents from the very poor area in order to reduce the potential for extra radiation clogging the telescope’s signal. It now has a tourist problem. And of course, this is not the first time a large science experiment has caused turmoil in a local community, as others have protested the Thirty Meter Telescope beginning construction above Mauna Kea. This is just the beginning for FAST, and it will surely release many more exciting results—after all, it’s the most sensitive radio telescope in the world, said Petroff. As for aliens, we’ll just need to wait and see.